Pasta is one of those foods that get a bad reputation among the low-carb dieters, but not everyone avoids carbs. The nice thing about pasta is that it plays well with other foods, especially sauces, and it’s easy to keep things healthy. 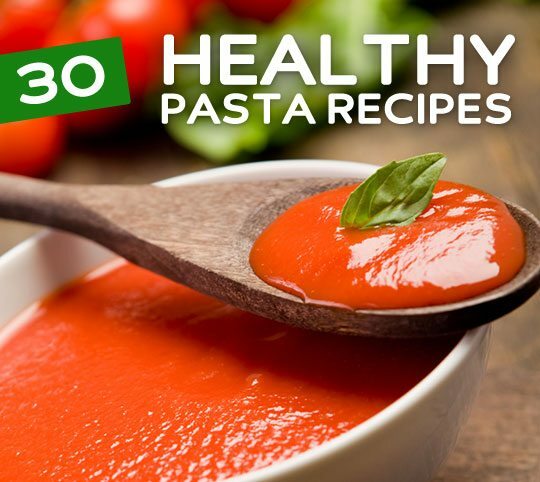 If your diet allows for pasta, here are plenty of healthy pasta recipes that will keep you busy for some time. Chicken and pasta go nicely together, since pasta is your carbs, and chicken provides plenty of protein to balance them out. It’s simply a matter of adding a vegetable to your meal and you’re all set. Creamy Tomato Chicken and Courgettes Fusilli – The courgette is a summer squash that is typically referred to as a zucchini. 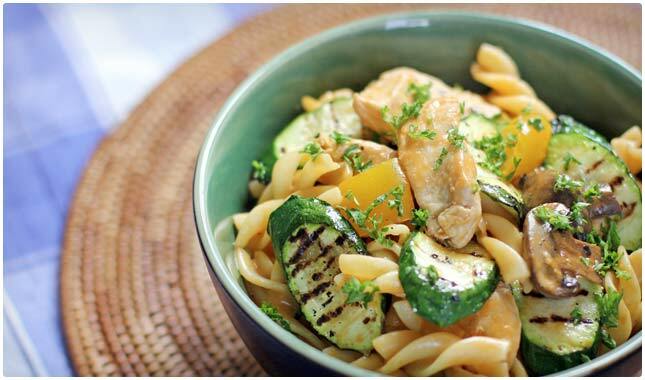 This is a super simple and super healthy pasta with grilled chicken and grilled vegetables. The pasta is sauced from a homemade creamy tomato sauce, but to keep it lean just coat the pasta lightly and keep the grilled vegetables and chicken separate when mixing in the sauce. Faralle Pasta with Lemon Chicken and Herb Salad – A great meal for combining your protein with your veggies. This dish contains moist sliced chicken breast, crisp green arugula and parsley, and a great light but refreshing herb sauce that gets soaked up in the “little ears” of the the farelle pasta making every bite packed with flavor. Not only flavorful, but also healthy as the sauce is made with lemon juice, olive oil, and various spring herbs. Chicken Tortellini Soup – Perfect for a cold and dreary afternoon, this Chicken Tortellini will come together in less than 20 minutes. It will come together even faster if you have leftover chicken breast, or you leave the chicken out all together. Great if you are sick as the chicken broth is the perfect remedy for those days that you feel run down, but it is also perfect for those currently dieting. Lemon Chicken Pasta – A great refreshing and light pasta salad for the spring and summer, made with a healthy portion of protein-packed chicken. This is another one pot meal that can be quickly put together to feed your whole family. The other great thing about this pasta is its versatility. If you want to make it vegetarian, you can substitute veggies for the chicken, and now you have multiple quick and healthy meals. One Pot Italian Braised Chicken Thighs – In this simple Italian recipe, you are trading a little bit of fat with a lot of flavor. Be sure to get boneless, skinless thighs to keep the meal low fat with high protein. Of course, you can always substitute the chicken thighs for boneless, skinless chicken breast, just be sure to reduce the cooking time of the chicken by a couple of minutes. A healthy and filling meal in about 55 minutes. See more healthy chicken recipes here. Pasta salads work great because they usually include a quality protein food, as well as plenty of vegetables. The following recipes have figured out how to keep them light and healthy by getting rid of the mayonnaise but keeping them full of flavor. 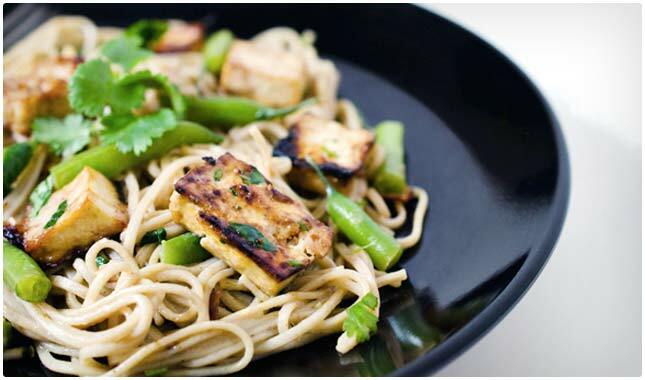 Skillet Soba, Baked Tofu and Green Bean Salad – Here’s an Asian-themed pasta salad that combines many healthy foods while keeping your total fat and calories to a minimum. Soba is a popular noodle in Japan and made out of buckwheat. It’s also using tofu instead of meat, so you’re not adding any extra cholesterol to the dish, and getting protein. The green beans give you extra nutrients and vitamins. Use low sodium soy sauce to make it even healthier. Chickpea, Couscous, Apricot, Feta, and Mint Salad – A perfect summer dish. This is a hearty salad with lots of vitamins and minerals due to the variety of veggies, legumes, fruits and couscous in it. It is also packed with a surprisingly high amount of protein due to the feta, chickpeas, and even the couscous. A great dish to serve up at your summer cookouts to add a little bit of a fancy touch. The Best Pasta Salad – The pasta salad -a potluck favorite – but this one is sure to win the prize for best pasta salad among all your friends. In addition, it will only take 20 minutes to make and it is fully customizable. 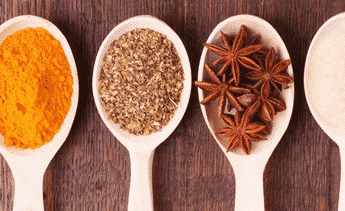 Some ways to enhance the health and the taste is to add various herbs. You can also increase the crunch by adding onions and bell peppers. A great summertime treat. Pasta Salad with Spinach, Pancetta, and Pomegranate – A beautiful salad once put together, and loaded with minerals and antioxidants due to the spinach, pomegranate, and almonds. It is also unique due to use of noodles in the pasta salad. This is a tasty salad to have a couple times of week due to the health benefits. To make it even better you can decrease the fat and the sodium by substituting the pancetta for turkey bacon. Basic Macaroni Salad – A great variation on a classic dish. The great thing about this dish is the various types of cheeses you can use to vary the flavor. try shaking it up and using goat cheese. Add eggs to increase the protein. Vary the sauce, or increase the vegetables. So many options in under 20 minutes. A great way to eat smart while balancing a busy schedule as chilled leftovers increase the flavor. Seafood and pasta work really well together, and most seafood will provide enough protein to counterbalance the carbohydrates in the noodles. These recipes help you keep things delicious without the use of fatty cream sauces typically served with seafood pasta dishes. Spicy Shrimp Scampi with Rosemary Cannellini – This dish combines take-out quality taste and speed, but with the ability to control the health and ingredients of a home-cooked meal. Each shrimp only contains 6 total calories that come mostly from protein. 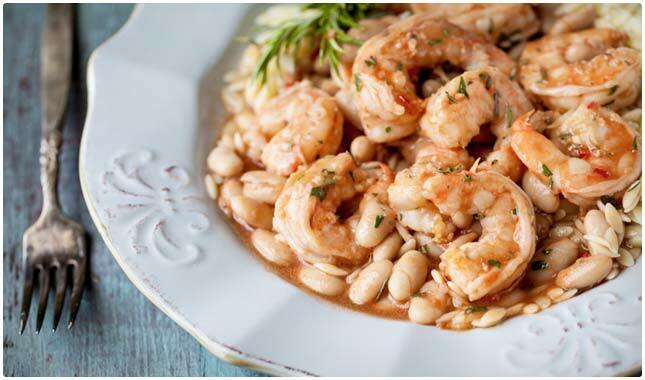 Not to mention, shrimp is packed with healthy fats and very easy to cook. This way you can fill up on more protein and fat, or more carbohydrates and fiber depending on your health goals. Shrimp and Glass Noodle Clay Pot – An extremely healthy Asian inspired noodle dish that can be quickly prepared to fuel you post-workout. Shrimp is the perfect addition to any health inspired dish as it contains a large amount of protein per serving, and contains plenty omega-3 fatty acids, which are essential to maintaining strong cardiovascular health, mental health, and happier moods. Avocado Alfredo Pasta with Spicy Shrimp – This simple and straightforward dish is equally healthy. This is a very versatile dish that can fit into many diets as there are a high amount of healthy fats from both the shrimp and the avocado. The shrimp will give you essential omega-3s that can greatly improve health, and the avocado is a great source of monounsaturated fatty acids, which are also considered excellent for cardiovascular health. Angel Hair Pasta with Scallops and Tomatoes – This is a great dish for a healthy and balanced diet. With angel hair pasta to provide for carbohydrates and energy, tomatoes to give phytonutrients and antioxidants, and scallops to provide protein and healthy fats such as omega-3 fatty acids, this dish is great for anyone looking for a well-balanced home-cooked meal. Cajun Shrimp Pasta – Although made with a cream sauce, the majority of the flavor from this dish comes from the cajun spice mix, so you can go light with the cream sauce, and heavy with the cajun spices to bulk up the flavor. Combined with the numerous nutritional benefits of shrimp, such as the high protein and high concentration of omega-3 fatty acids, this dish is a great accompaniment to a balanced diet. Pasta dishes are pretty popular in vegetarian cuisine. Perhaps it’s because vegetables and pasta taste great together, especially with the right amount of seasonings or sauce. Here are a handful of ways to make amazing meat-free pastas. 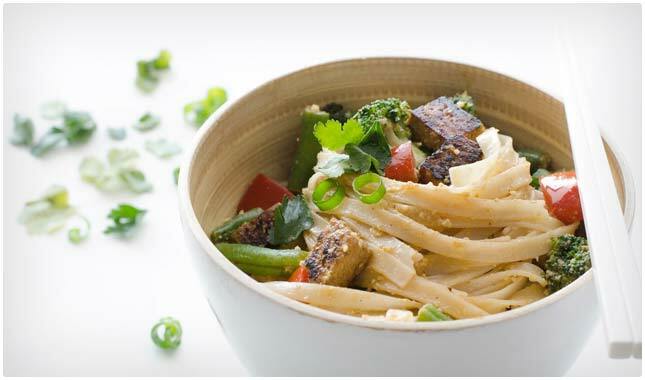 Vegan Thai Coconut Noodles – This dish is perfect for vegans and vegetarians that want something to replicate a heavier feel, but still is still a great heart and humane selection. Made with rice noodles and tofu, this is a meal that is true to Thai flavor, but in a much simpler and faster cooking time. Not to mention, this a great way for vegans to get healthy fats from the coconut milk, which has been shown to help rev up your metabolism. Minty Creamy Vegan Pasta – Usually when you see creamy it means fatty, but not in the recipe. It’s vegan so there’s not going to be any cream used because it’s an animal byproduct. So they’ve come up with an interesting way to make the cream using oats. This not only helps you avoid the fat, but also adds the healthy properties of oats, like increased fiber. Mushrooms help your immune system and black pepper gets your metabolism going. Tortellini Soup with Spinach and Tomatoes – Often times tortellini is stuffed with cheese and loaded with cream-based sauces on top, but this recipe is a nice twist because it is actually a tortellini soup with spinach and tomatoes added in. Homemade chicken broth for the soup base will make this a great recovery soup, either post-workout or just when you are feeling rundown from a stressful week. Whole Wheat Pasta with Spicy Roasted Cauliflower – A great alternative to those who want a less processed pasta as this dish substitutes regular pasta for a whole wheat pasta. Often times, a good quality whole wheat pasta has a nice nutty flavor which goes extremely well with the roasted cauliflower. This dish is low in fat and oil, and a great healthy alternative for vegetarians. Red Beet Gnocchi with a Meyers Lemon Pesto – Another unique, beautiful, and satisfying vegetarian meal. This red beet gnocchi is packed with antioxidants, vitamins, and minerals from the beets, but it is also unique as it a great way to get carbohydrates that are more natural and less processed. Not to mention, there is an excellent pesto sauce for additional flavor. You simply can’t go wrong with beets, an often overlook superfood with plenty of health benefits. Guilt-Free Garlic Parmesan Zucchini Noodles – Gluten-free pasta is ideal for those with gluten intolerance or celiac disease. If are wondering how it is possible to have pasta without gluten, this recipe shows you a great way to get the feel of eating pasta that soaks up sauce, but in a much healthier fashion. Zucchini is used as pasta substitutes in this recipe, but you can also use a spaghetti squash to create gluten-free noodles. It’s a great way to enjoy “pasta” again, without upsetting any allergies or sensitivities to gluten. See some healthy vegetarian & vegan recipes. If you buy lean cuts of beef it can provide a big protein kick, while keeping your fat levels low. The protein and carbohydrates will give you a satisfied feeling that can sustain you for hours, and you don’t have to have the post-pasta snoozies that can sometimes occur when it’s not balanced. 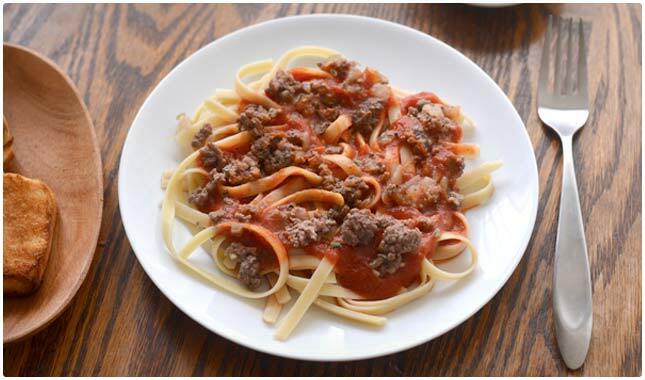 Beefy Tomato Sauce and Pasta – A cool, classic, and convenient dish, the beefy tomato sauce and pasta is a twist on the plain but ever popular spaghetti and meatball. It can be made with virtually any type of pasta and a variety number of cuts of beef, but the key to the dish is perfecting the tomato sauce. Simple to make, with so many variations to call your own you might consider filing this in your “frequently made” category. Easy Baked Lasagna with Pulled Beef – A hearty meal that is sure to hit the spot after a grueling workout. Packed with the protein and quick digesting carbohydrates you need to maximize your post-workout gains, this lasagna is great to get in the oven ahead of time and then eat right after working out. You can’t go wrong with this recipe, it’s easy to make considering it’s lasagna which usually takes a lot of effort, and it is great for leftovers. Beef Teriyaki Noodle Stir-Fry – Stir fry has to be one of the most versatile, healthy, tasty, and easy ways to cook a meal. This dish adds a bit of mystery with a special sauce. The sauce is mostly composed of soy sauce, vinegar, and water. This gives a great sweetness to the sauce, and really infuses the beef and the noodles with a great, healthy Asian aroma and flavor. Veal and Mushroom Spezzatino with Potato – An amazingly hearty, and flavorful one-pot meal loaded with 54 grams of protein per serving, this dish provides exactly what you need on a winter’s day. Spezzatino or “stew” in Italian is a great way to cook a home cooked meal for the whole family that can be started when you get home, and finished without hassle as it just slow-cooks in a dutch oven. This recipe adds even more flavor with veal, mushrooms, and potatoes. Pasta is eaten in most parts of the world, and the following recipes can give you a taste of different cultures right in your dining room. The use of different spices and ingredients will wake up your taste buds and give you new pasta inspiration. 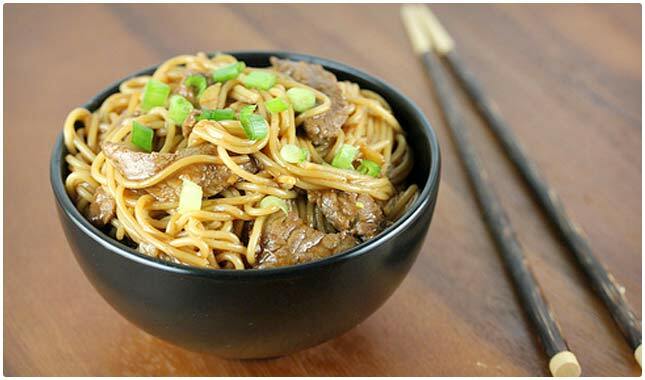 Szechuan Noodles with Beef – A classic asian noodle dish, but made with your own flair. Feel free to add extra meat on the cheap to boost the protein content. Most of the flavor in this dish comes from traditional Asian ingredients such as ginger, garlic, sesame oil, and hoisin sauce (which is a traditional Chinese dipping sauce). Go ahead and replace the beef with shrimp or pork for variety, for continued authenticity. Beef Stir Fry with Miso Bourbon Teriyaki Sauce – A great way to clean out all your leftover vegetables, this stir fry is sure to leave you drooling as you cook it. This dish provides so many flavors and colors. Not only that, but this recipe also allows for guilt-free eating as you pack on the vegetables. Pack it with extra steak and vegetables to really boost the health content. Easy to adapt for all diets. Chicken Laska – Spicy Malaysian Noodles with Chicken – Great for those who have a hot streak, or love thai food but don’t have experience with Malaysian curry. Laska is a Malaysian curry paste–you can find this in a local Asian market or make it yourself at home. Often the ingredients vary, but be sure to find one with shrimp paste to keep the flavors authentic. A one pot meal that looks more intimidating than it actually is. Chinese Beef Bok Choy Noodles – Bok Choy is packed with health benefits, and this recipe is a great way to get lots of bok choy and protein into your diet. We all know that protein is essential to maintaining muscle, energy, and youth, but Bok Choy can also go a long way to promote health. It is packed with antioxidants, vitamin C, folic acid, and potassium. Not to mention it has a great flavor and crunch to it, so, if you have never tried it out, this is a great dish to start with. If you’ve been avoiding pasta because you heard it makes you fat, you simply have to make sure you’re getting a good amount of protein with it, and keeping your portion sizes in check. It’s easy to overeat on a really good pasta dish, so choose a good-sized bowl and don’t overfill it or go back for seconds. If you’re still feeling hungry make sure there’s a side of vegetables with the meal and have more of those.